· Future Perfect: образование и случаи употребления. · Образование третьей формы глагола. Теперь можно преступить к упражнениям на отработку Future Perfect. Упражнение 1. Вставьте глагол во времени Future Perfect. You __________ over half a thousand words when you finish this English book (learn). Упражнение 2. 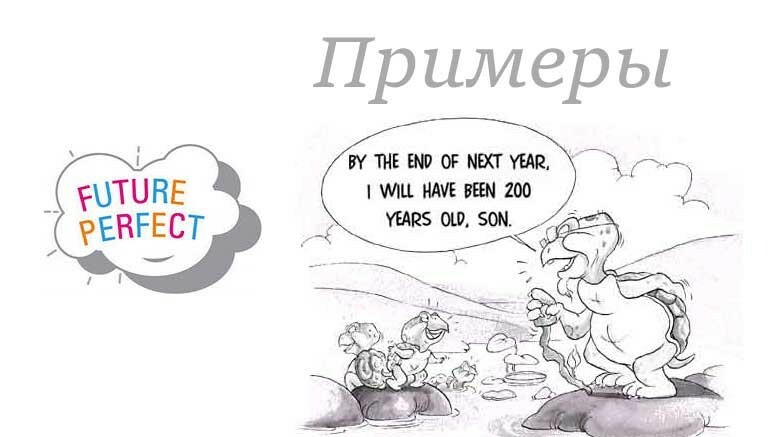 Ответьте, используя Future Perfect Tense и слова в скобках. Oh, no, Jilly will have finished her essay by that time. Упражнение 3. Составьте предложения во времени Future Perfect. have / Jill / she / perfected / will / from / her / by the time / Japanese / comes / Tokyo. promotion /Melody / have / By December / will / her / received. gets home / Helen’s / cleaned / By the time / relatives / she / will / the house / have. to communicate / Steven / he / learned / Will / have / well / Chinese / before / enough / flies to Beijing? finishes / have / By the time / twenty / taken / Jillian’s father / that course / he / will / online tests. Упражнение 4. Translate into English using Future Perfect. Майкл закончит этот отчет до завтра. Студенты доделают работу к трем часам по полудню. К июню мы сдадим сессию. Строители построят школу к началу сентября. Я напишу заявление к тому времени, как приедет секретарь. Поезд уйдет, пока мы доберемся до станции. Зоя переведет этот доклад к понедельнику. К ночи Меган переведет эту длинную статью. Стивен уже уедет в Париж, когда Молли вернется из Конго. Зора не дочитает эту дурацкую книгу к концу года. Ответы к упражнениям на Future Perfect. 1 will have been, 2 will have finished, 3 will have been, 4 will have started, 5 will have finished, 6 will have spent, 7 will have left, 8 will have cooked, 9 will have finished, 10 will have had, 11 will have finished, 12 will have translated, 13 will have made, 14 won’t have learnt / learned, 15 won’t have completed, 16 will have learnt / learned, 17 will have come, 18 will have gone. Oh, no, the couple will have moved to the old beach house. Oh, no, the committee will have made a decision by then. Oh, no, the pupils will have finished their test by 10. Oh, no, Mike’s niece will have finished school by next autumn. Oh, no, Greg will have forgotten Molly. Oh, no, Greg will have left for China by Tuesday. Jill will have perfected her Japanese by the time she comes from Tokyo. By December, Melody will have received her promotion. By the time Helen’s relatives gets home, she will have cleaned the house. Will Steven have learned Chinese well enough to communicate before he flies to Beijing? By the time Jillian’s father finishes that course, he will have taken twenty online tests. Michael will have finished this report by tomorrow. The students will have finished the work by 3pm. By June, we’ll have passed our exams. The builders will have built a school by September. I will have written an application by the time the secretary comes. The train will have left before we get to the station. Zoe will have translated the report by Monday. By night, Megan will have translated this long article. Steven will have left for Paris when Molly comes back from the Congo. Zora won’t have read the stupid book by the end of the year. Надеюсь, Вы сочли полезными эти Future Perfect упражнения. 2 Комментариев для "Future perfect: упражнения с ответами"